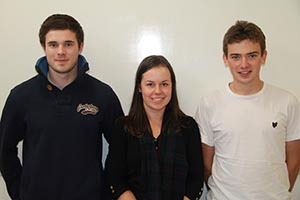 Congratulations to Camille French, David MacDonald and Ruaridh MacDonald, fourth year chemical engineering students, who won Engineering Leadership Advanced Awards from the Royal Academy of Engineering. The Engineering Leadership Advanced Awards provide motivation and support for exceptional engineering undergraduates in British universities who have the potential to be future leaders of industry. MEng students in the third year of a five-year course are eligible to compete for the awards, which are worth up to £5,000 each, as well as access to experienced mentors allowing them to benefit from carefully planned training and targeted support over three years.